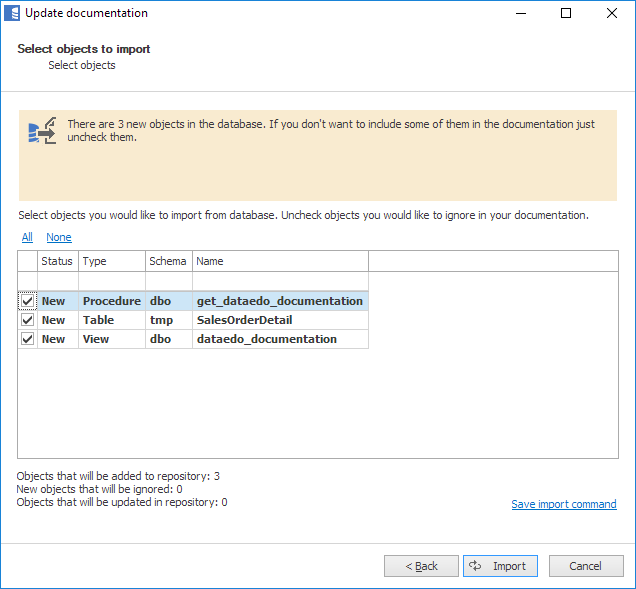 When your database schema changes you can import those changes and update your Dataedo documentation schema in a similar way you imported it. To update documentation click Update documentation button for the ribbon. This will open update wizard. The first screen is a connection form. Connection details are populated from last connection - at import or last update. If you didn't use 'Save password' option at last connection then you need to enter the password. Note: you can change connection details to point to a different database (even on a different server) In this case, use 'Reimport all objects' option that is available in next step. This may cover scenarios where you migrated databases to a new location or you want to switch between Dev, Test and Live environments. By default, the import will use the same filter you used last time. To change the filter, check the Advanced options box. 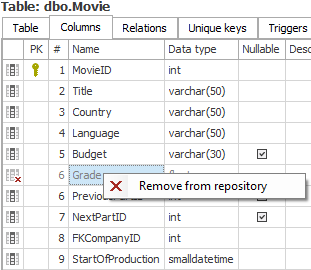 Next form will present changes in database schema since last import. You may choose to exclude some of the new objects from importing by unchecking them. You may also choose to include previously ignored objects by checking them. To import changes click Import button. After update, all new, updated and deleted objects in navigation tree will be marked with icons. 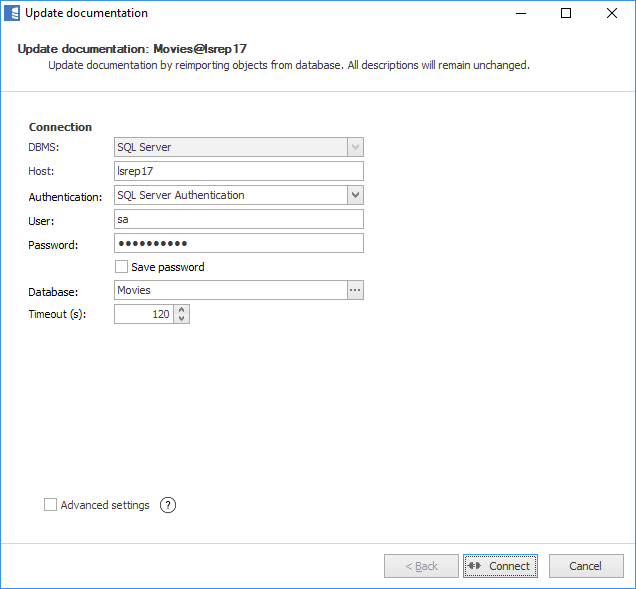 Dataedo gets (filtered) a list of objects (tables, views, stored procedures and functions) from the server with last modification date (this does not include MySQL - see details in the chapter below). Then it compares list by names with the list from a repository. Objects that do not exist in the repository are considered new, objects that do not exist in the database are considered deleted. Objects that names match but server modification date is newer than the one in the repository (dbms_last_modification_date column) are considered updated. New objects are simply added to the repository. New objects are marked with star icons in a navigation tree. The icon disappears after view gets refreshed. Deleted objects are marked as deleted but are still visible in the editor. All content is preserved. You may preview such objects and decide to delete permanently from the repository - all content will be lost. Deleted objects are marked with red cross icons in navigation tree. 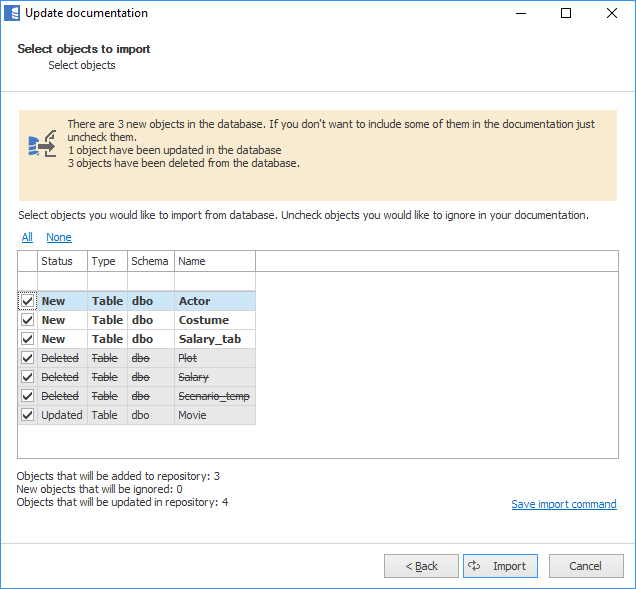 Deleted objects and its elements are ignored from all exports. Note: once you delete the object from repository its name gets to the list of ignored objects and if the object with that name will be created again it will be ignored from future imports. Read more about ignoring and removing objects from documentation. If an object is detected as updated its definition is read again and compared to the one in the repository. Each element (column, key, relation, trigger, parameter) is looked up by the name - if found, then attributes (data type, nullable, relations' and keys' columns, etc.) are updated in the repository. New elements are added to the documentation. Missing elements are marked deleted just as it happens with objects (for more details go to Deleted columns, keys, etc. section). Existing descriptions are never overwritten. Descriptions are imported from the database only when empty in the repository. Updated objects are marked with green tick icons in the navigation tree. The icon disappears after view gets refreshed. If the object gets renamed it behaves just as if it was deleted and created with a new name. This works for objects (tables, views, stored procedures and functions) and their elements (columns, unique keys, relations, triggers...). If the object was marked as deleted you need to review its descriptions. If there were any entered in Dataedo repository with the editor you might want to copy them to new object. This needs to be done manually for main object description and all its elements (i.e. columns, keys, etc.). Once you no longer need any descriptions of deleted object you may remove it permanently from the repository. You can do it with Delete key or Remove from repository option in ribbon or context menu (right click). Similarly to objects (table, views, etc.) also their elements (columns, keys, parameters, etc.) are marked deleted when missing in import. The idea is the same - copy the description and delete with Delete key or Remove from repository option in context menu (right click). 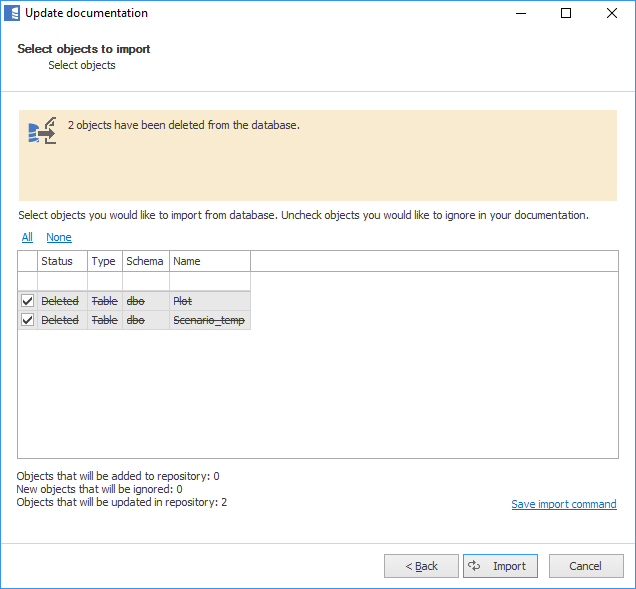 Renamed columns, keys, parameters etc. work the same as objects - element with an old name gets marked as deleted, and an element with a new name is created. And again, copy the description from old to the new element if required and delete the old element.